It's no secret that white men embody the largest percentage of serial killers in the United States. Which immediately begs the question, why? What incites such rage in white males, the most privileged people in the nation, that they resort to multiple homicides? 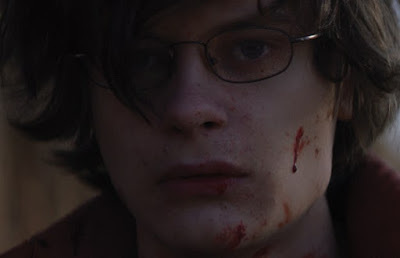 Of course, there are many reasons why people kill other people, but I felt a particular need to understand this motivation when I watched director Kevin Phillips's disturbing 90s-set drama, SUPER DARK TIMES. Premiering at the Tribeca Film Festival last week, the movie follows Zach, Josh, Daryl, and Charlie (Owen Campbell, Charlie Tahan, Max Talisman, and Sawyer Barth), a group of high school friends hanging out near the woods one day when Josh accidentally kills Daryl with a sword he takes from his brother's bedroom, presumably to impress his friends. It seems innocent enough, so to speak. Josh is visibly horrified, instantly going into apology mode aimed mostly toward his best friend Zach, who he clearly thinks highly of. He even suggests they call the police. They opt to keep it a secret among themselves instead. A series of random murders around town follows. The scene near the woods is a triggering moment in the film that propels the narrative from a "kids will be kids" high school drama to a psychological drama highlighting the unpredictable and fragile mindset of young white boys from good homes in Suburbia who commit senseless crimes. But the movie fails to really explain the motivating factor behind these murders. The murders are already arbitrary (and sudden), yet screenwriters Ben Collins and Luke Piotrowski seem to take advantage of our willingness to accept the arbitrary with no accountability. Or maybe they see how society has become desensitized to white male serial killers that they don't feel the need to explain. But, I have questions. For starters, why? Did what happen in the woods ignite a previously dormant homicidal rage? Are the homicides reactions to the trauma? Is he just acting out as a cry for help? And if we're supposed to just accept this as a portrayal of typical white male angst, we still deserve a multidimensional character study. Shifting the lead character from Zach to Josh would have also helped. SUPER DARK TIMES can certainly be commended for its scarily accurate portrayal of young white male angst, its solid performances, and deceptive setting but I still have trouble reconciling with what it's ultimately trying to say. Is it possible that teenagers aren't particularly stable, grateful, reasonable, or objective? Is it possible that males of all shades and backgrounds possess an adaptive predisposition toward violence? Is it possible there isn't a simple, succinct, or definitive answer to your question, and it's meant to encourage us to consider humankind's universal latent potential for evil deeds and their gravity? I haven't seen this film, but I have seen films. Some spoon-feed you affirmatory conclusions and comforting ideologies. I for one prefer the other sort. "It's no secret that men embody the largest percentage of serial killers in the United States." "...males, the most privileged people in the nation..."
"...fragile mindset of young boys from good homes in Suburbia..."
"...society has become desensitized to male serial killers..."
"..accept this portrayal of typical male angst..."